My name is Lori Plyler and I'm a gleek. "Oh my gosh! I open my mouth and a little purse falls out!" P.S. I was thrilled to get into an Etsy Fashion feature today. Eeeee! It's about time you got into the Etsy blog!Congrats!! your work is soooo deserving! I generally dislike musicals, except "white Christmas" (is that a musical? 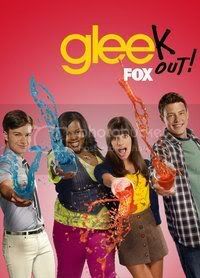 they do sing alot) but I love Glee!!! Love Glee! (But missed this episode...will watch it tonight on Hulu!) I did a treasury for fun called Gleek Love. No one but me saw it but I think it was pretty cool. I love musicals. I have participated in several in my years in Community Theatre. My Fair Lady, Annie Get Your Gun, Fiddler on the Roof... but the one that I like best was the one time I played the lead... Hello, Dolly! I love all musicals though. Ones I have seen in the past few years... The Putnam County Spelling Bee is great, the Lion King on tour and Les Miserables at our local h.s. that was outstanding. GLEEEEEEEEEEEEEEE -Was that the best song EVER?!?!?! Never could imagine those two songs together - I think all 6 of us stopped and stared at the screen!!! God I love the old Movies like Singing in the rain and anythingwith Fred Astaire and Ginger Rogers!! !I don't think I could pick just one! I'm new to Glee but am already hooked! I started watching it a couple of weeks ago when Ken went out of town, and I am loving it! I love the musical dance scenes. Favorite musical? I'd have to say Mamma Mia - saw it last year on Broadway with my mom and LOVED it - the live version was much better than the movie (though I still liked the movie, too). I watch Glee with my daughters, 14 and 17. We've been disappointed at times and sometimes I am really shocked at the content. We are in it for the music and enjoyed this week's Singing in the Rain number. We are huge musical fans. My daughter and I made a list - we've seen over 30 live performances. The kids have been involved in grade school and high school productions - either in them or in the pit. I love being surprised by a musical - which I was with Jesus Christ Superstar and Jekyll and Hyde. I was not familiar with either of those prior to seeing but the music in JCS blows me away, as well as making you think in a different way (human nature of JC.) Same w/Jekyll/Hyde - like Wicked, makes you think about good vs. evil. Plus, some amazing music. Last professional musical I saw was Chicago and loved it! This year I'm going to see Les Mis. Saw a student version last summer, which was superb, in an old barn theater...one of the few remaining in the country.